1. By honoring all written contractual obligations agreed upon. 2. By promptly acting or acknowledging all complaints by consumers, regardless of how unreasonable they may appear, and by encouraging consumers to have an approved third party to remedy the dispute. 3. By writing all contracts and proposals that are fair and beneficial to both parties concerned, free of misleading or deceptive practices. 4. By making all advertising and sales promotions accurate in description and costs, by avoiding to deceive or mislead. 5. By conducting themselves in a professional manner with respect to all being served. 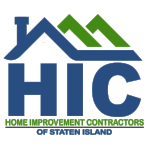 HIC of Staten Island, Inc. is a non-profit professional organization dedicated to the education and professional development of the Residential Improvement/Remodeling Industry serving Staten Island and the surrounding area. HIC of Staten Island, Inc. is a Non-Profit Trade Association with General Members who are licensed, insured and bonded to conduct business in New York City, with an Associate Membership base that supports our General Member businesses. HIC members are qualified craftsmen, who have full-time businesses, and are dedicated remodeling professionals. Through an extensive screening process and the requirement of our members to follow a strict Code of Ethics, homeowners can be assured that any time they hire a HIC member, they are hiring an individual who has made a strong commitment to professionalism in the remodeling industry. Our Members must be licensed by the Department of Consumer Affairs of NYC (or appropriate agency for specialized trades) for a minimum of three years before joining, and undergo a rigorous screening process to insure HIC Members have an upstanding customer service record.